Bodybuilding.com Fit Expo 2011 Brought To You By Optimum Nutrition. The 2011 Bodybuilding.com Fitness Expo Brought to you by Optimum Nutrition proved to be the best yet with a long list of events and special guests. June 11, 2011 at the Qwest Arena in Boise, Idaho. Catch all the action! The 2011 Bodybuilding.com Fitness Expo Brought to you by Optimum Nutrition proved to be the best yet with a long list of events and special guests. This celebration of bodybuilding and fitness is the biggest and most unique Fitness related EXPO in Idaho and is located in the beautiful city of Boise, the home of Bodybuilding.com. This year&apos;s expo included Powerlifting, BMX and skateboarding, Cross Fit, Bench Press Competition, MMA, the Fit Body Competition and much, much, more. Athletes and models converged to teach about fitness and nutrition with renowned companies within the fitness and nutrition industry. View over 975 award-winning photographs of the 2011 Bodybuilding.com Fitness Expo by world-class photographers Isaac Hinds and Ron Avidan! The 2011 Bodybuilding.com Fit Expo welcomed some of the biggest names in fitness, including Mario Lopez, Terry Crews, Jamie Eason, pro bodybuilders, pro MMA fighters, and many more. 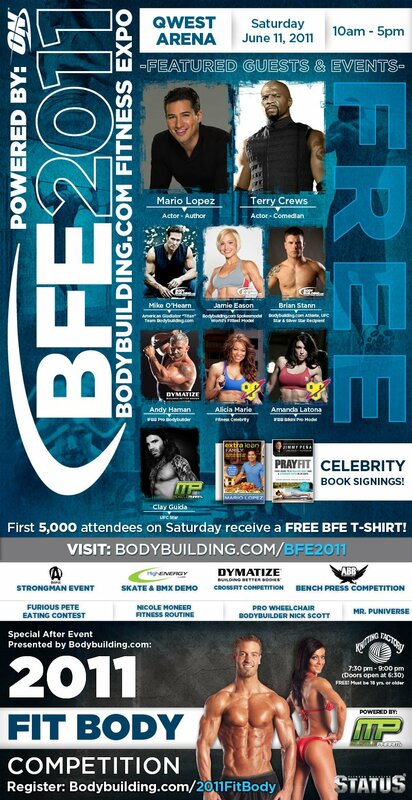 2011 FIT BODY WINNERS Announced! See who took home $500 cash and won a free photo shoot with leading photographer Josh Wolfe for an upcoming feature in STATUS Magazine! Links to photos and results also provided. Over $5,000 in cash and prizes! One male and one female winner will take home $500 and win a free photo shoot with leading photographer Josh Wolfe for a feature in STATUS Magazine! To be held outside the Grove Hotel throughout the day. Sign up at the event. Most reps at 225 lbs. will win. Cash prize for top 3. Crossfit competition free to enter. Cash prizes for winners. The Fit Body competition will be held at the Knitting Factory.